John Christopher Anderson, founder of Momenta Group in 2008, has been an active player in the photographic and communications industry for nearly two decades. 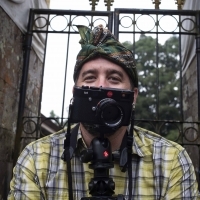 His background includes roles as photojournalist, daily news and travel photo editor, and as a Photo and Illustrations Editor for National Geographic Society. This collection of experience, plus a passion for the Craft of Concerned Documentary Photography, helped him find the inspiration to launch Momenta. The company has creative, educational, and consulting divisions specializing in nonprofit and NGO strategic communications and educational workshops. In 2017, Chris helped Momenta launch a charitable nonprofit called Wildfire Media, which provides capacity-building and development assistance, along with a dose of inspiration, to under-supported NGO communities, charities and documentarians around the world. The challenges of using powerful visual messaging and open-source research content, as a vehicle for educating the public, has grown into his biggest passion of late.